Update: This model has now been superseded — read the Sansa Clip Zip review for more information. When we reviewed the SanDisk Sansa Clip, we were impressed with its features and sound quality considering its low cost. SanDisk has now released the Sansa Clip+ which comes with new and improved features — the most visible addition being the MicroSD card slot. But, has SanDisk improved on their original portable enough to stay competitive in the growing budget MP3 player market? MicroSD card slot expands the player's capabilities. An improved set of features. Still comes with a very short USB cable. Just like its predecessor, the unit is very small and the included clip on the rear of the MP3 player makes it practically wearable anywhere. Interestingly the clip on the back is now a fixed feature and can't be removed as you could with the Sansa Clip. The unit's design has also been improved and is more aesthetically pleasing — the case is more rounded and sleeker looking. Overall, SanDisk has done a great job of tweaking the Sansa Clip+ in terms of style, ergonomics, and build quality. The package contents are virtually identical to that offered with the original Sansa Clip — even down to the very short USB cable. Unfortunately, this hasn't been improved upon and so if you haven’t got USB ports on the front of your computer or a USB hub, then transferring files and charging the unit could be inconvenient. Charging The Battery: The SanDisk Sansa Clip+ has a rechargeable battery that is charged via the supplied USB cable (mini-USB). According to the specifications, you can expect to get up to 15 hours of playing time from a full charge. Earphones: SanDisk has packaged a decent set of earbuds with the Sansa Clip+. They are comfortable to wear and give a good audio response. The 3.5mm jack plug is gold-plated and there is a generous length of wiring that also acts as the aerial for the built-in FM radio. Transferring Music: The Sansa Clip+ supports two USB modes for transferring audio files; these are MTP (Media Transfer Protocol) and MSC (Mass Storage Class). In MSC mode the device acts like a normal removable drive; MTP mode is useful for subscription services that use DRM protection. During testing, the Sansa Clip+ was detected automatically without any problems (Windows Vista). If you use a software media player (Windows Media Player, Winamp, etc. 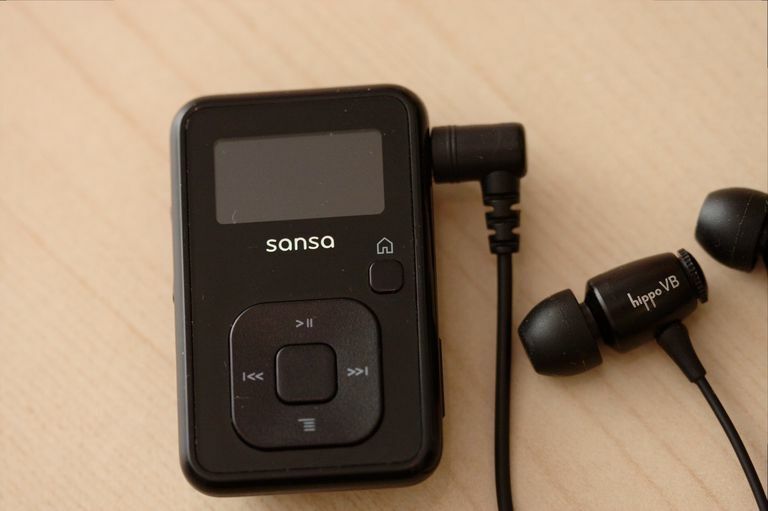 ), you can then synchronize your music with the Sansa Clip+. Controls: The main user interface is almost identical to the original — the unit now sports a square 4-way control pad, rather than a circular one as before. However, one downside to the new design is the absence of a back-lit control pad. This was a great feature in the original unit that gave you visual feedback every time a button was pressed. Overall, the controls have been improved upon. The multi-function slider switch (on / off / hold) has been removed in favor of a more user-friendly on/off power button; the controls are also better positioned. Menu System: For the menu system, SanDisk has kept with the intuitive interface that made the original Sansa Clip so easy to use. As before, each of the menu items has animated icons and a description, these are Music, slotRadio, FM radio, voice, and settings. SanDisk has made a number of additions to the menu system such as the new Replay Gain feature (useful for volume normalization) and the inclusion of the slotRadio menu to enable you to play audio from MicroSD, slotRadio, or slotMusic cards. While playing a music track, the screen displays battery level, album, track title, and artist. Other useful information includes track playing time, playlist number, and progress bar. Pressing the select button (located in the center of the control pad) displays a real-time 16-band graphics equalizer which is a nice 'eye candy' feature. SanDisk has done a great job of improving on the original menu system while keeping it user-friendly. Screen Display: The Sansa Clip+ sports the same back-lit 1.0-inch color OLED screen as the original. The colors used to display the text and graphics (blue and yellow on a black background) makes using the display easy on the eyes. Screen brightness levels are also good, but this can be changed in the settings menu. microSDHC Card Slot: This is probably the biggest single improvement that makes the Sansa Clip+ so expandable. As well as using your own microSD or microSDHC cards, the device is SanDisk slotRadio and slotMusic ready — purchasing a slotRadio card for example instantly gives you an extra 1,000 songs. FM Radio: There are 40 presets for you to store your favorite radio stations and you can even record what you hear by pressing the down button. This is a useful option if you want to record for later playback. Microphone: Not all MP3 players double as a voice recorder and so this feature adds value to an already feature-rich portable. On testing, we found the voice recording to be surprisingly clear. Sound Quality: The Sansa Clip+ produces crystal-clear sound. Bass sounds are tight and punchy, while high-end frequencies reasonably detailed. With the addition of new features such as a microSD card slot, more supported audio formats, and enhanced menu options (i.e Replay Gain), the Sansa Clip+ has once again impressed us. The unit's design feels more solidly built than before, and the controls are easier to use. The most notable upgrade though has to be the microSD card slot that is also slotRadio and slotMusic card ready. Although it's hard to find fault with the Sansa Clip+, there are a couple of minor annoyances: the very short USB cable; and the absence of a back-lit control pad. However, these two minor annoyances don't overshadow the fact that the Sansa Clip+ is still a gem of portable that offers a great set of features and above all — superb sound. Are FM Modulators Still Worthwhile? MSC Mode: The Best USB Setting to Use for Syncing Music?